The two House GOP projects are aimed at fighting undocumented immigration and strengthening President Donald Trump’s deportation force. The House of Representatives passed two Republican immigration bills on Thursday, one to sanction sanctuary cities for not collaborating with the federal government and another that would increase the penalties for undocumented deportees who return to the United States without authorization. The first initiative, known as the “No Sanctuary for Criminals Act” ( H.R. 3003), would block funds from the Department of Homeland Security (DHS) to sanctuary jurisdictions that do not comply with federal arrest warrants. The second proposal, known as the “Kate’s Law,” seeks to increase jail time for undocumented immigrants who enter the country without authorization after being deported. Kate’s Law ( H.R. 3004) is named after U.S. citizen Kate Steinle (32), who died last year in San Francisco after being shot by undocumented Mexican immigrant Francisco Sánchez, who had been deported several times and returned to the United States illegally. Immigration and Customs Enforcement (ICE) had asked authorities in San Francisco to arrest Sánchez, but the San Francisco police released him on the grounds that people in the country without authorization are not handed over to immigration agents unless there is an arrest warrant. The Steinle case has been used by President Donald Trump as an "example" of violent immigrants arriving in the country. It’s part of the anti-immigrant discourse he brandished throughout his campaign, which has continued since his arrival to the White House on January 20. On Monday, White House spokesman Sean Spicer said both bills are "priorities for the president," in his fight against undocumented immigration. It's not known how the Senate will respons to the bills. Republicans hold 54 seats in the Senate; 60 votes are required to pass laws. Democrats, who are a minority in both houses, would vote as a block against the proposed sanctuary law, but it’s unclear how they will vote on Kate’s Law, The Hill reported Wednesday. "They will have less pressure," the site said. Kate's Law is sponsored by the House Judiciary Committee chairman, Republican Bob Goodlatte (Virginia), who gave it a go-ahead for a vote in plenary. Rep. Adriano Espaillat, from New York said he fears the "No Sanctuary for Criminals Act” will “send a chilling effect, forcing people into hiding,” adding that both bills don't just target criminals. "We all oppose any violent criminals," he said. "We want them to be arrested and do their time in jail and go back to wherever they came from. But what about the millions of immigrants who wait tables and wash dishes? 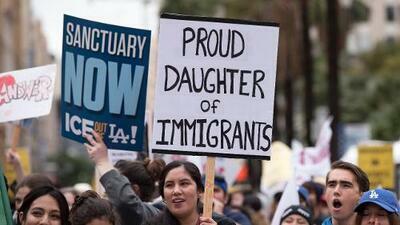 What about the millions of undocumented immigrants who are nannies and take care of our children? What about the millions who take care of our senior parents and grandparents?" The American Civil Liberties Union (ACLU) said Wednesday that both bills "are plagued by constitutional violations that completely ignore the civil and human rights of immigrants." Both Kate's Law and the law punishing sanctuary cities "will make our communities less secure because they will undermine the community's trust in law enforcement," said Lorella Praeli, ACLU director of immigration and campaigning. Organizations defending the rights of undocumented immigrants expressed serious concerns over Thursday's vote. "These measures are only a continuation of the attacks against our community orchestrated by Republicans," said Cristina Jiménez, executive director of United We Dream. The purpose of these measures is to "terrorize Latinos and people of color,” she added. "The police are not immigration agents, they are to help the community not to persecute it," said Juan José Gutiérrez, executive director of the LA-based Latino Movement USA. Jorge Mario Cabrera, communications director of the Immigrant Rights Coalition (CHIRLA), commented that both measures "are unnecessary and smell of discrimination against undocumented people, and punishment of the municipalities that welcome them." The "No Sanctuary for Criminals" law states that no state, county, or city can prevent its officials from helping federal authorities enforce immigration laws. In addition, it lifts restrictions for inquiring about the immigration status of any individual or notifying the federal government of the presence of undocumented immigrants. It calls on the government to publish an annual list of sanctuary jurisdictions that would lose funding. The bill would also grant immunity to local jails that comply with ICE requests to keep immigrants in custody until the agency arrives to take them. Finally, the law would establish that relatives of victims of certain serious crimes committed by undocumented persons may sue the local agency that let him out of jail, if that undocumented person had a pending ICE detention request.